Burton Cons B welcomed the talented Ashby Ivanhoe A side in week 2 of David Wain Insurance Premier Division. Mike Buckland and Andy Marriott exchanged a number of good pots and small breaks before Andy took the first frame on the colours. He egan the second frame strongly with a 40 break. Back came Buckland with a break of 38 to get within touching distance. A touch of misfortune from Marriott lead to his opponent having a chance to win it on the colours, which he did, to level the match. Ant Moore won the first against Dave Shipton, but needed a snooker in the second frame on the final pink and black. He managed to get it and clear to take the frame. Ryan Gibbs and Ian Rennocks shared two competitive frames. Finally, Jon Swift knocked in a superb black to win the first frame against Daniel Blunn. However, his opponent responded by taking the second frame to earn a 5-3 victory for the visitors. Alrewas A were looking to bounce back after their opening day defeat but could only draw with Spot On A. Karl Hancox showed some good form as he compiled a 44 break in defeating Tom Elliott. Tom Smith and Ady Harper won a frame each. Mark Stirling made a 34 break as he shared the frames with John Richardson. Finally, Colin Wood found Andy Speirs to be too good on the night as the spoils were shared. Belmont B were beaten at home by Tutbury A. Steve Mabbott and brother Dave did the damage as they won all the frames on offer against Brett Craddock and Zaheer Hussain respectively. Mark Vaughan made a nice 34 against Chris Mabbott as the frames were shared. Ant Shorthouse closed out the match as he drew with Steve Hathaway. Ivanhoe B won 6-2 against Spot On C. Mick Kirk made a rare appearance for the B team and took both frames against John Hardy. Jason Pickering and Trevor Heath won a frame each. Bren Mattley also drew with Tony Clements. Stu Tagg proved to be the match winner as he defeated Steve Gaunt. Swadlincote Snooker Centre A went down 6-2 at home against reigning champions Burton Cons A. Graham Stevens looked a little shaky at first against Steve Ayre and his opponent took advantage by taking the first frame. Normal service resumed in the second frame as Stevens took it on the colours. Matt Milnes made his first start of the season and he looked like he had never been away as he knocked in breaks of 44 and 41 in beating Chris Dewey. Darren Coady showed his usual, composed snooker as he beat John Davis. Andy Goldingay played Owen Jones in the final game and the visiting player should have been put to the sword on a number of occasions but somehow escaped with a draw, which completed the scoring. Spot On B won 6-2 at home against Rolleston A. Joe Docksey and Tony Rushton took frames for the visitors but Steve Lane and Lee Cooke won all the frames against Luke Speed and Bobby Cliff to secure the win for the hosts. Swad Cons A drew with Belmont A. Simon Mansfield won both frames against Graham Bailey with some good potting. Ian Archer then showed the young pretender how it’s done as he beat Andy Grainger. Paul Slater made a draw with Arron Vaughan and Mark Hadley shared the frames with Josh Gebbie to complete the scoring. The outstanding result of the week took place at Burton Cons but it was the visitors, SDSC B, who left with an incredible 8-0 victory.In the opening encounters Tom Egginton was out of form as he lost to Henry Tomas, whilst Adam Harrison included a good 29 on the way to defeating Lee Louch.The second half was no better for the Cons as Pete Maguire rolled in a 32 against Matt Hucker and Simon Shilton had a 31 in his defeat of Cons’ captain Ian Shrive. Woodville A mad amends in some way for their heavy opening day defeat by beating Rolleston B 5-3. Alan Orpwood won two tight frames versus Lionel Lewis, having to pot pink and black in both frames.Mark Bennett took the first against Tony Coleman taking it on the pink after potting a difficult green and brown. Mark conced the second on the yellow. Bob Tubey took the first frame against Jim Marcer whilst Jim returned the compliment to secure a draw in the second in what was a fair result.Another draw took place between Pat Ryan and John Harvey. pat won the first comfortably but gave John too many chances in the second to enable John to get a draw but it was the Woodville boys who went away with the winning bonus point. Stapenhill A won the battle between 2 sides who had won their opening match. They beat SDSC D 6-2 with wins for Jason Spiby and Steve Ford against Brian and Garton Bloor respectively.David Wain and Andy Gretton shared as did Carl Jeffcoate and Andy Bloor. It was a close game at Newhall where the home side entertained Alrewas B.Both teams could have won it but a draw was probably a fair result. Sam Hicks took the first frame against Carl Poulton. Poulton took a nice 24, then Hicks a nice 25, inevitably it went to the final black where Hicks jawed it but the white ball then came rolling down slowly to chip it in. Poulton responded well though with an easy second for the draw. Mark Anslow was much too hot for Trundler Trueman in both frames. Some slick potting in the first with Trueman well off the pace. The second just as easy with Anslow building a big lead that Trueman could do nothing about. Nick Trayford and Adam Walton’s frames both ended on the final black. The first Walton could and should have won about 5 times but didn’t and left the door open for Trayford to steal. The second much closer but this time Walton sealed it with a nice final black. That left Ian Hiley to salvage a draw for the Legionaires – which he did. Martin Hicks well off the pace on the night as Hiley deserved both, even though the second went to the final black, with some slick potting and safety play. Stapenhill B scored a good 5-3 win against Rolleston C. Stan Piechovicz rolled back the years to score against Jon Sully whilst Brian Sherratt also won beating Mick Taylor. John Sherriff drew with Billy Ashton who knocked in a nice 27 along the way. Tom Lucas for Rolleston brought some respectability to the scoreline in his 2-0 win over Tim Knopik. SDSC C were only able to field 2 players in their match against Tutbury B. The result therefore was never in doubt although Nick Harcombe was able to save the whitewash by beating Dean Johnson. Bill Stewart won the only other match that took place against Ray Bancroft. Young star wins frame on debut! 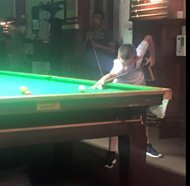 Some Impressive results in division two this week but non more so than that of young Charlie Groves on his BDC Snooker debut – he secured his first frame of the season! Charlie showed character beyond his years by fighting back after the disappointment of losing his first frame and secured the draw with the second in style! Mark Vaughan, he said of Charlie’s historic winning frame, “Charlie has been a joy to coach, he is very modest and owns up to foul strokes. He takes notice, and more importantly, he enjoys the game. I thought his first win was a month or two away—certainly not on his debut, I’m very proud of him, we all are!”. Charlie shared victory with his teammate Andy Biggadike [also making his debut] as he secured a two nil win- ensuring Belmont D stopped to a 5-3 victory over Rolleston. Also this week, Tutbury C, Alrewas C and Woodville C all secured 7-1 victories. Fran McNulty of Woodville C’s Wonderboys masterminded two 49 breaks! Spot on D’s Snookerettes drew away to Woodville, ‘super-sub’ Clare Peaty was superb to win 2 nil while Kate and Gilda fought hard but just couldn’t capitalise on the fact Woodville had just three players on the night. Alrewas D drew to Burton Cons D, Alrewas’ Thom Smith knocking in a 32 break along the way.